Director – Brad Anderson, Screenplay – Joe Gangemi, Based on the Short Story The System of Dr Tarr and Professor Fether by Edgar Allan Poe, Producers – Mark Amin, Bruce Davey & Mel Gibson, Photography – Thomas Yatsko, Music – John Debney, Visual Effects – Filmgate (Supervisor – Daniel Nielsen), Special Effects Supervisor – Svetozar Karatanchev-Zarko, Production Design – Alain Bainee. Production Company – Icon Productions/Sobini Films. England in the year 1899. Young trainee doctor Edward Newgate travels to Stonehearst Asylum in a remote part of the country, hoping to study psychiatry. He is welcomed by the asylum’s head Dr Silas Lamb and observes Lamb’s progressive methods in which he dismisses the barbaric treatment used by the medical establishment and instead allows patients to roam freely and to indulge their delusions. Edward becomes fixated on the beautiful Eliza Graves who has been locked there after blinding and biting off the ear of her husband for his unnatural sexual appetites. He then discovers that Lamb keeps a group of people locked in cells in the basement in a terrible condition. They reveal that they are the rightful doctors, nurses and staff of Stonehearst and were drugged by the inmates who then took over the asylum. As Edward tries to help free them, he draws closer to Eliza and tries to persuade her to come away with him. As the imprisoned staff warn, if Lamb and the other inmates realise their ruse has been detected, they will kill him. For some years now, I have been consistently impressed with director Brad Anderson, even if his name has flown under the general radar without quite winning widespread acclaim. Anderson first appeared with the non-genre The Darian Gap (1996) and Next Stop Wonderland (1998), before making his genre debut with the charming time travel romance Happy Accidents (2000). His next film Session 9 (2001), a psycho-thriller set in an abandoned asylum, gained reasonable word of mouth, as did his subsequent effort, the reality blurring The Machinist (2004) starring an anorexic Christian Bale. Anderson went onto the non-genre thriller Transsiberian (2008) and the cryptically interesting last people on Earth film Vanishing on 7th Street (2010), before having a box-office hit with the Halle Berry psycho-thriller The Call (2013). Eliza Graves announces that it is based on a short story by Edgar Allan Poe. It doesn’t mention which one but the story is The System of Dr Tarr and Professor Fether (1845) in which a visitor to an asylum finds that the lunatics have taken over and are posing as the doctors. (It is from here that we get the common saying “lunatics running the asylum”). The Poe story has been filmed several times – the lost silent short Lunatics in Power (1909), as Maurice Tourneur’s silent The Lunatics (1913), as an episode of the German Poe anthology Tales of the Uncanny (1931), the Mexican Dr Tarr’s Torture Dungeon (1972), Claude Chabrol’s French tv adaptation The System of Dr Goudron and Professor Fether (1981) and Jan Svankmajer’s Lunacy (2005), while the basic idea has been uncreditedly used in films like Don’t Look in the Basement (1973), Silent Night, Bloody Night (1974) and Committed (1991). Eliza Graves is very different to all the other versions of The System of Dr Tarr and Professor Fether. Most notedly, unlike all the others, it does not keep the revelation that the lunatics are running the asylum as its big twist but gives it away around the 30-minute mark and thereafter becomes a drama about the one sane doctor in the facility trying to escape. (That said, the film does get in a fine twist ending that really makes you gasp, which sort of justifies the way Poe had the theme working for him). While most of the other adaptations have fallen into the horror genre in one way or another, Eliza Graves plays out more as a costume drama. To this extent, Brad Anderson and company have done a fine job in making the costumes, the hospital and surrounds all seem as though they are authentically period. The film makes a point of depicting the barbarism of the psychiatric practices of the period. The opening scene with Brendan Gleeson as a lecturer dispassionately talking about psychiatric ills to a lecture hall of students in a full flowering of 19th Century terminology as a bound Kate Beckinsale sits in the chair before him sets the scene perfectly. However, this then causes a problem for the story in that the sympathies are all awry. Jim Sturgess’s character is supposed to be shocked to discover the real staff are imprisoned in the basement and that the lunatics are running the show upstairs. Something in you does an about face when you realise that Ben Kingsley in his belief that the patients shouldn’t be locked up and allowed free has the most progressive and humane psychiatric outlook of anybody in the film yet is shown to be a dangerous lunatic, while Michael Caine and cohorts are the ones enforcing barbaric tortures and antiquated practices on the patients yet we are supposed to regard them as sympathetic. The film has a sensational line-up of names that would be considered a dream cast for an A-budget film. The great surprise about this is that Eliza Graves did no theatrical business at all, not being released in many parts of the world, and instead floundered about under different titles before being dumped to dvd. Part of the reason one suspects that this may have been the confusion of the publicity department in selling it – where the film’s retitling Eliza Graves, after the supporting character played by Kate Beckinsale, tends to make it seem like a regular costume drama. Among the cast, everybody is on top form even when they are in small bit parts with Ben Kingsley does an especially good job as the patient posing as the asylum head. Jim Sturgess is fine as the milquetoast wet behind the ears newcomer. 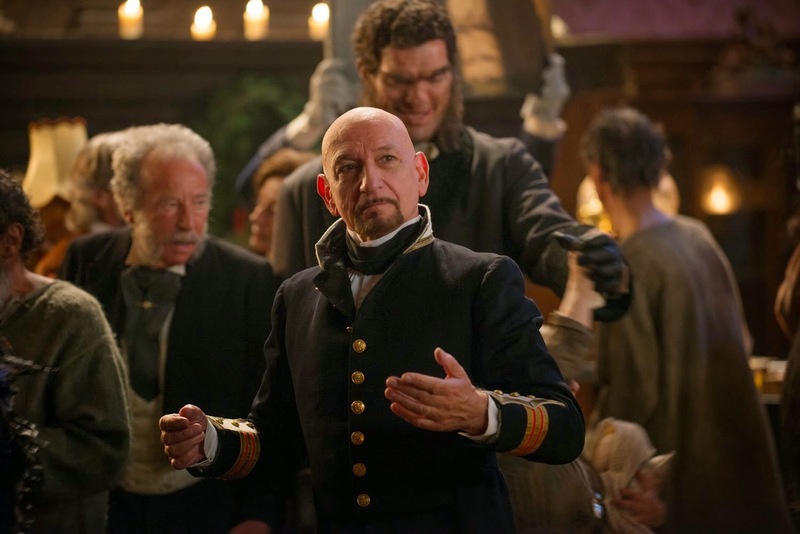 (Nominee for Best Supporting Actor (Ben Kingsley) at this site’s Best of 2014 Awards).